Laying bare a strong moral clash, President Barack Obama on Thursday (June 27) urged African leaders to extend special rights to gays and lesbians but was bluntly rebuked by Senegal’s president, who said his country “still isn’t ready’ to decriminalize homosexuality, according to a AP report. Obama opened his weeklong trip to Africa one day after the U.S. Supreme Court struck down the defense of traditional marriage in the US federal law to grant special rights for gay couples. In his first in-person comments on the ruling, Obama said the court’s decision marked a “proud day for America.” He pressed for similar homosexual acceptance in Africa, wading into a sensitive area in a region marked by stark moral contrasts with the US. Dozens of African countries outlaw homosexuality, with their past experience of widespread boy abuses by homosexuals. 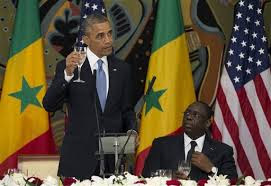 During a news conference with Senegalese President Macky Sall at the grand presidential palace in Dakar, Obama touted the striking down of the defense of marriage in the US federal law. He urged Sall to have similar legal changes in Senegal, putting the defense of traditional marriage below the gay agenda. However, Sall gave no ground. Senegal, he said, is “still not ready to decriminalize homosexuality.” Will it be ready someday? It will depend on the “persuasion” powers by the US government. “Cultural imperialism,” an excellent video produced by Family Watch International (http://youtu.be/HbjAFUGQ3Xg), shows how UN and US use pressure and blackmail to force developing nations to embrace immoral agendas. By the US measure, will not African nations be labeled democratic until their adherence of immoral agendas, especially the homosexual agenda? Reportedly, 38 African countries criminalize homosexuality. This, in Obama’s view, is undemocratic. Democratic is what the US government does: indoctrinate its school children into homosexual perversions and criminalize criticism of wicked homosexual acts plainly condemned by the same Bible that was instrumental in the lives of the Founding Fathers. Curiously, current America is a vast moral contrast not only with African nations, but also with the America envisioned and created by her Christian Founders. Essentially, the Bible and Christian values have been criminalized in America, which abandoned their Bible-based Republic to embrace and impose a homosexual advocacy democracy. With information from Associated Press.